What can I do about cats around my bird feeders? Feral and other outdoor cats are currently one of the largest threats to birds and other wildlife, including small mammals, reptiles and amphibians. In the United States alone, the American Bird Conservancy estimates that cats kill approximately 2.4 billion birds a year. However, this is not only a problem in North America, it is a global issue. In some countries, such as Australia, extreme measures are being made to protect vulnerable birds and unique wildlife from cats. Domestic cats are not a natural part of the ecosystem and when they are introduced to the natural environment, native wildlife are threatened. Cats are very skilled predators, able to sneak up on birds and wildlife on the ground or at low feeders. It’s not a cat’s fault that they are efficient predators, this is how they have evolved. Please note that all of information provided on our website about our products is meant to be informative only. For more information regarding prices and shipping (within Canada only) please visit our store in Barrie (515 Bryne Drive, Barrie, ON), phone us (705) 726-7600 or send us an email [email protected]. At WBU Barrie we are cat lovers (almost all of us have been cat parents at one time or another) and we are also passionate about backyard birds. It’s our goal to keep cats and backyard birds and wildlife safe and keeping cats indoors is the safest thing for all parties involved. Ask your neighbours to keep their cats indoors as well. As a pet owner you want to keep your cat safe from any dangers and roaming free poses a lot of risk to your beloved family member. Being hit by a vehicle is one major concern, but there are other concerns as well. Outdoors your cat is at risk of getting diseases and/or parasites, fighting with other cats, breeding with other cats, having dangerous interactions with wildlife such as skunks, raccoons, porcupines, foxes and coyotes, being subject to harsh weather, getting stuck in trees (no really there is an entire TV show on cat rescues from trees), injuries from jumping from heights, getting tangled in burdock and other plants, and several other risks. Great Horned Owls are also expert hunters more than capable of hunting a cat as prey. Another serious risk to outdoor cats is getting lost. While you may be confident in your kitty’s ability to navigate back home. Many cats get lost and eventually end up in shelters where they may or may not make it back home to you. How many times have you seen a “Lost Cat” sign? Too many! “The cat population is far from healthy in Canada. An estimated 261,000 cats in shelters did not find homes in 2016. Twice as many cats are dumped in shelters compared to dogs, and whereas 68 per cent of stray dogs are reunited with their owners, only 10 per cent of cats are returned home. Cats are also frequently run over by vehicles. More than 1,300 dead cats were collected on the streets of Toronto in 2017! Estimates indicate that many of those cats — as many as 30-40% — are allowed to roam unsupervised outdoors. Outdoor cats are exposed to a variety of threats, including diseases (e.g., FIV, FLV, cancer, heartworm), vehicle collisions, and fights with wildlife and other cats. Humane Canada (The Canadian Federation of Humane Societies) is one of many organizations that urges cat owners to keep their pets indoors unless the cat is supervised or in an enclosure. While cats’ independent natures might lead some people to treat them like something between pet and wildlife, we owe them the same level of care we give dogs. Letting cats roam unsupervised outdoors isn’t just bad for cats. It’s bad for birds too, as well as for people. Many of Canada’s birds are in trouble; some have declined by over 90%, and cats add to the list of risks that birds face. The official list of Bird Species at Risk increased from 47 to 86 between 2001 and 2014. Habitat destruction and climate change are taking their toll, but a lot of birds die due to other human actions and decisions. Environment Canada research estimates that, in addition to the impacts of climate change and habitat loss, 130 to 433 million birds a year die as a result of people. While it is extremely difficult to calculate the number of birds killed by pet and feral cats — especially when the number of feral cats is not well understood — cats are thought to cause 75% of those deaths. There is no height tall enough to hang your feeders so a cat cannot attack a bird. Birds by nature drop food on the ground as they eat. This will attract ground feeding birds such as Northern Cardinals or Dark-eyed Juncos to your yard, and on the ground, they are highly vulnerable to cat attacks. Baby birds often hop around on the ground and they too are highly vulnerable to attacks. Also, cats will climb if possible, to get to a bird on a feeder (we’ve seen them on top of sheds across from the bird feeders at our house). It is against the bylaws in many communities to allow cats outdoors to roam onto other peoples property. If you’re a cat owner you probably know it’s almost impossible to keep your cat in your yard without a leash, so by letting your cat outdoors you are allowing them to visit neighbouring properties without consulting your neighbours. If you’re a cat owner who lets their cat outside to roam free, reflect on this, you wouldn’t let your dog run free on the neighbour’s property without permission, right? So why is your cat any different? Your neighbours may not appreciate your cat using their property as a litter box, digging in their garden or harming the wildlife they cherish. In addition to helping the birds stay safe, keeping your cat indoors also respects your neighbours. “Calgary has an extremely effective model that includes licensing, no roaming at large, a subsidized spay-neuter program, the promise to return escaped cats, and perhaps most importantly, a public awareness campaign. Shelters are financed from licensing revenue, and feral cats are cared for by the Meow Foundation, a consortium of not-for-profit organizations. Outdoor cats are experts at hunting anything that moves and is small enough for them to capture. All types of wildlife from small mammals, birds, reptiles, amphibians and even insects are at risk from cat attacks. Keeping your cat indoors respects the biodiversity in your local ecosystem. Remember, cats are not a natural part of the ecosystem and when you introduce an animal into an ecosystem where is doesn’t belong it can react havoc. Cats are great at showing their love for you after time spent outside by leaving you “little presents”. If you’re the owner of a cat who roams free outside you probably know what I mean, dead rodents or birds left right at your doorstep as a sign of their affection for you. You probably don’t relish in the task of cleaning up these gifts and by keeping your cat indoors you won’t have to deal with this unpleasantness. We often hear people say their cat has a bell on its collar to warn the birds. We hate to be the bearer of bad news, but bells don’t work. Cats are too stealthy, and birds often don’t hear the bell. In addition, bells advertise your cat’s whereabouts to larger animals like foxes or coyotes. Colourful collars that are large and obvious work a little better, but still aren’t perfect and certainly won’t stop you cat from hunting other wildlife like reptiles or amphibians. In discussing letting pet cats outdoors we sometimes hear people say “my cat is too old to hunt the birds”, “it never leaves my yard” or “my cat just likes to watch the birds at my feeders.” This is simply not true. While your cat is probably the cutest and most lovely cat out there, through no fault of his own, he is also a predator. Let’s be real here, you’re not going to be able to watch your cat while outdoors for the entire time and just because kitty stays in your yard most of the time doesn’t mean this is always the case. Also, during the spring and summer months (the months when cats would enjoy the outdoors the most) birds are nesting and baby birds are around. Predators like cats may drive a bird off its nest to the determent of its babies or the cat may predate the entire nest of baby birds. On a recent documentary on cats and birds, a camera on the collar of a cat revealed the cat predating an entire nest of babies warblers. In short, while you may know your cat well, it still impossible to know exactly what it’s doing outdoors. If all of the above information hasn’t convinced you that kitty belongs indoors and you still plan on letting your cat roam free, we strongly suggest you don’t feed the birds. It’s not fair to your backyard birds to bring them into your yard only to be predated by your cat. Those birds are a native part of your backyard bird diversity and they may have young ones who depend on them. Not feeding the birds will not stop your cat from killing birds, but it may reduce the number of kills slightly. We plead with you to keep your cat indoors, but at the very least don’t make it easier for them to attack birds. 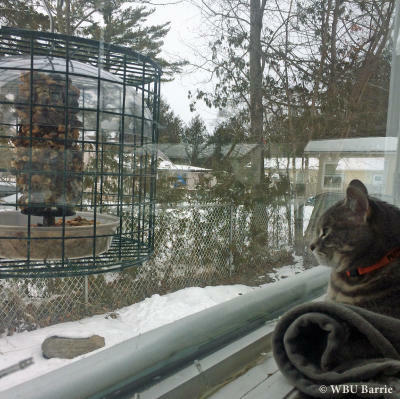 If you would like to give your cat some fresh air or let them enjoy watching the birds, there are a few ways your cat can enjoy watching your feeders while keeping the birds and other wildlife safe. Let your cat enjoy looking at your bird feeders from the safety of a window or sliding glass door. Many of our customers buy feeders to sit on the window just to entertain their precious pets. Our WBU Window Feeders are probably the most popular choice by cat owners and from the photos we get sent, cats love them! Many responsible cat owners enjoy providing their pets with time outdoors with supervision. Catios, a fenced in outdoor enclosure for cats (Google it for inspiration! 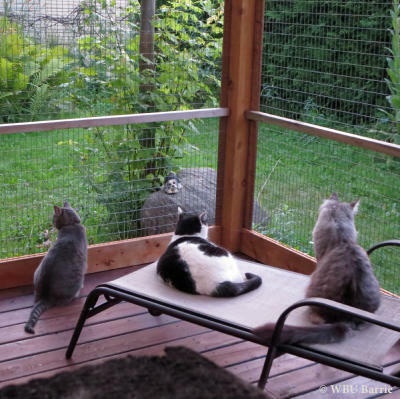 ), are a wonderful way for cats to enjoy being outdoors while also being kept safe from harm and while keeping birds and wildlife safe. Our very own WBU Barrie Team Member Jen, cat mom to 3 cuddly felines, enjoys time with her cats outdoors in their spacious and very cool catio. The birds are safe to eat at her feeding stations and the cats get to enjoy watching the bird and the fresh air. You can also enjoy supervised outdoor time with your cat by keeping kitty on a leash and in your sight at all times. There are several great social media accounts out there of responsible cat parents who spend quality time with their felines while in their company and on a leash. Some even travel the world with their owners (cat backpacks are a thing). It’s a win-win for your cat, the birds and you. If you feed the birds you’ve probably experienced a cat at your bird feeders at one time or another. It’s a frustrating part of feeding the birds, but one that we all usually experience at one time or another. However, there are a few ways you can decrease the likelihood of a cat killing the birds at your feeders. Please note, these methods are not going to stop attacks 100% and are not “solutions” for allowing your pet cat outdoors while feeding the birds. If cats are a concern place feeders 10 feet or more from low bushes or other ground cover. Prune trees and shrubs so that low branches do not offer cover and birds can see under them. A cat in the open has less chance than one hiding in the bushes to sneak up successfully. Place barriers at the base of any trees and shrubs near your feeders (plastic or metal fencing works), this will slow a cat down when it springs out from under a bush and give the bird more time to escape. Place a low fence around feeders. The fencing should have mesh large enough for birds to fly through but small enough that a cat must jump over. We suggest 3” x 3” or 4” x 4” mesh so that larger birds like doves can escape too. When a cat has to jump over a fence the birds have a microsecond’s advantage and may be able to fly away in time. It is also helpful to try and limit the number of birds feeding on the ground. Don’t offer food in ground feeding trays or in piles on the ground. Feed No-Mess food options that keep the majority of food in your feeder and off the ground. There are a few sprays, plastic spikes and ultrasonic devices that may work to deter cats. CatStop Ultrasonic Cat Deterrent seems to be a good product. These deterrents may be effective in your yard and might be worth trying out. Motion-activated sprayers are handy for keeping away deer and cats. Cats hate to get sprayed with water and if it happens to them often enough, they just may leave your yard alone. Some sprayers come with their own water tank and others need to be attached to a hose. The angle of spray is generally adjustable from narrow to 360°. These can only be used in non-freezing conditions.